The Faculty of Nuclear Sciences and Physical Engineering at the Czech Technical University in Prague offers a five-days workshop on plasma experiments at the GOLEM tokamak. This workshop offers an interactive course on fundamental and advanced toroidal plasma physics which is suitable for both undergraduate and post-graduate students. The course covers important aspects of experimental work on tokamaks, i.e., tokamak operation, plasma control, diagnostics and processing of experimental data. To offer hands-on experience of tokamak operation and to teach its basic principles. To become familiar with basic instrumentation related to tokamak operation and diagnostics. To provide working experience with an integrated tokamak facility, including planning of experiments, plasma control, data acquisition and processing commonly used in today’s fusion plasma experiments, finalization and presentation of experimental results. (All students) Hands-On measurements of plasma parameters like loop voltage, plasma current, toroidal magnetic field, electron temperature. Basic info. 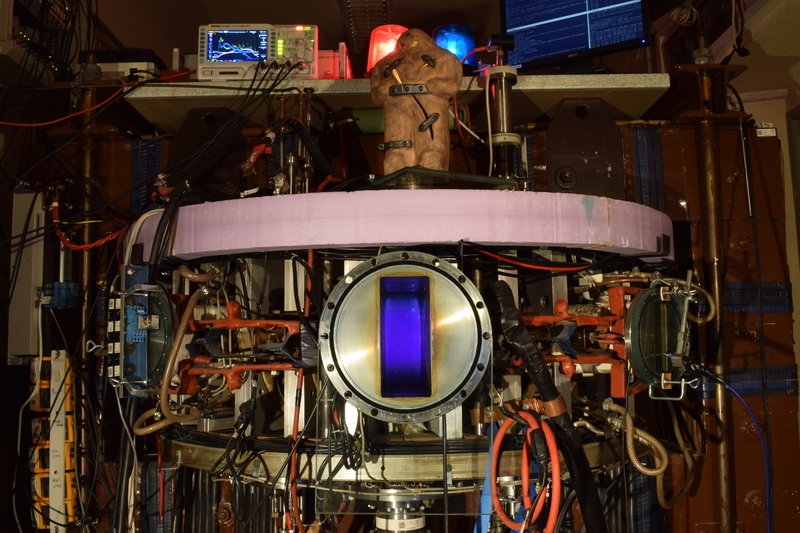 (3 students) Study of runaway electrons in GOLEM tokamak: This task aims to introduce NaI(Tl) scintillator to participants and measure runaways using the scintillator. Followed by data processing and analysis. Basic info, lead by Pravesh Dhyani. (3 students) Plasma position control by vertical stabilization: The goal of the task is to measure plasma position by magnetic diagnostics, understand the measurement method and control plasma position by vertical stabilization coils. Basic info, lead by Jaroslav Cerovsky. (3 students) Turbulence characterization with ion saturation current measured with Langmuir probes: The goal of the task is to analyze the distribution function of density fluctuations, i.e. describe the skew, kurtosis and exponential or power law tails and to relate the findings to theory. Basic info, lead by Katerina Jirakova. (3 students) Mach number measurements using the tunnel probe, Basic Info and manual, lead by Jan Stockel. (3 students) Density measurements by microwave interferometer. Basic info. For the preparation of data processing, 1-2 weeks before the workshop, all the participants will communicate with their respective supervisors about the data analysis, software and the routines to be used during the workshop. 8:15 Meeting at the hotel Henrietta reception. Joint departure to the GOLEM tokamak with Jaroslav. 11:00 Operational regimes of the GOLEM tokamak - Jan Stockel at the Faculty Atrium .. presentation. 12:30 lunch at Baterka (Bílkova 5, Praha 1), please choose your option in menu. 14:00 Runaway electrons in tokamaks (their physics and recent results from GOLEM tokamak) - Pravesh Dhyani at the Faculty Atrium .. presentation. 14:45 Tokamak edge plasma physics and Langmuir probes - Katerina Jirakova at the Faculty Atrium .. presentation. 15:30 Plasma position measurements and its stabilization - Jaroslav Cerovsky at the Faculty Atrium .. presentation. 14:00 Tasks based experiments and data analysis in groups. 9:00 Tasks based experiments and data analysis … cont. 14:00 Tasks based experiments and data analysis … cont. 9:00 Tasks based experiments and data analysis and preparing reports and presentations … cont. A maximum of 15 (maybe even more…) participants can be accommodated in the workshop. welcome dinner on Monday and social dinner on Thursday (reasonable financial support per person ~15 euro). Send a motivation letter, curriculum vitae and a simple recommendation letter from your tutor to vojtech.svoboda@fjfi.cvut.cz ASAP, at least before Wednesday 13 February 2019 23:59 CET. You can try to apply for the travel support at the Fusenet Student Funding Schemes if you are eligible. We expect to start on Monday at 9:00 AM and the end is planned at 2:00 PM on Friday (including lunch). Basic info on the event location, public transport etc. is available here. Our preliminary list of participants. Please contact us to edit it according to your wishes.